The M.S. 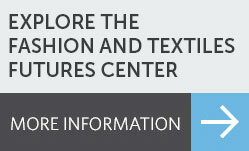 in Textile Design at Thomas Jefferson University offers an integrated, collaborative and proven curriculum that blends aesthetic, creative skills with emerging technologies. In studios and classrooms, students turn innovative ideas into original products. State-of-the-art facilities, including The Center for Excellence of Digital Printing, electronic jacquard and dobby looms, computerized knitting machines, and extensive computer-aided design laboratories enable students to put professional skills into practice. The Design studio courses make up the majority of the coursework in the M.S. program and design research is stressed from the beginning. Graduate students select either knit, print or weave as their area of concentration and the courses are taught by active members of the textile design field: artists, design directors, authors and researchers. Visiting artists and guest lecturers expand the educational experience, bringing real-world applications to the classroom experience. Partnerships with industry, nexus learning sponsored projects, national and international design competitions and exhibitions at international trade shows provide practical experience as students prepare for graduation. The PhilaU Textile Design program is enhanced by study abroad opportunities and a strong internship program. This PhilaU program gives graduates a commanding competitive edge in the global textile marketplace with our graduates attaining positions in all areas of the industry from national and international firms to boutique specialty retailers.